"no group of professionals is more capable of identifying innate communicative and intellectual competence than the AAC professional...(Shane, 1993a)"
For Howard Shane, writing off people who cannot talk is easy. For us to reply is hard, but you have to have gone for half your life without speech to understand the full horror of what he is saying. 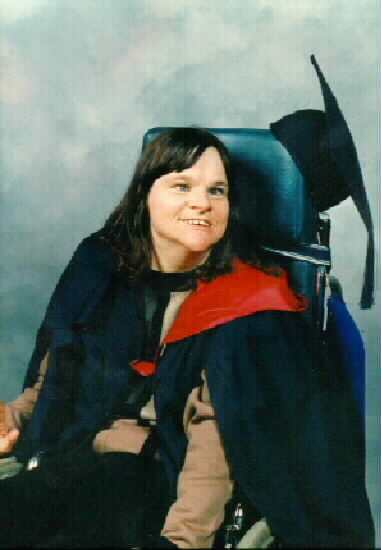 I have had athetoid cerebral palsy since birth and was once diagnosed as having profound intellectual impairment. I cannot talk, walk or feed myself, and I communicate by spelling with facilitation — that is, with someone supporting my arm while I point at letters on an alphabet board. I was placed in St. Nicholas Hospital, Melbourne, a state institution, at the age of three, and lived there without education or therapy for twelve years until Rosemary Crossley established communication with me in 1977, when I was 16 years old. The hospital relied on its own tests. When I was seventeen, for example, a pediatrician had been asked to assess my intelligence. The doctor refused to be told how I signalled ‘yes’ and ‘no’ — he said it might bias his assessment. He refused to see me in my posture chair, insisting that I be lain on my back. I couldn’t sit up unsupported, and I couldn’t use my hands. He wanted me to reach for a plastic ring, and when I didn’t he concluded that I was functioning at a less than 6/12 level. I was 17 — what would reaching for a plastic ring have proved? That I was a good baby? On his tests I could never have shown that I was intellectually normal. In the course of the dispute I was given, and passed, a series of validation tests using facilitated communication. In 1978 several psychologists gave me messages to pass on to a facilitator who did not know the messages and set me comprehension questions on written passages not seen by the facilitator. I passed the messages and answered the questions successfully, and the psychologists informed the hospital that I could read and spell. These tests are recorded in Annie’s Coming Out, the book I co-authored with Rosemary Crossley in 1980. The hospital authorities ignored the positive reports of the psychologists then just as Howard Shane ignores them now. I nearly starved to death on the floor of St. Nicholas. Many other children died there. Starving children with cerebral palsy to death is slower and nastier than gassing criminals, and is surely a cruel and unusual punishment even by American standards. Howard Shane doesn’t care what happens to people unless the words they spell have been certified as correct by him and his colleagues. In 1979, when I was eighteen, I took a habeas corpus action against the Health Commission in the Supreme Court of Victoria in order to win the right to leave (Crossley & McDonald, 1980). My parents and the hospital authorities denied my request on the grounds that the reality of my communication had not been established. The Health Commission psychiatrists attempted to conceal the favourable test results from the court , but they came out anyway, the court accepted that my communication was my own, and I was allowed to go. If Howard Shane had his way I would never have left, because he would have tested me until I failed. I don’t like any suggestion that my communications aren’t mine. They asked me again the following day. I spelt out another protest. On the third day, in response to a personal appeal from the Senior Master of the Supreme Court, I passed a message, with only minor changes; the message given was the two random words ‘string’ and ‘quince’, and the message I spelt was the two words ‘string’ and ‘quit’. That was enough for the court. The chance of randomly spelling those words was somewhere between a thousand million to one and five million million to one. My ability to read and spell has been as reliably validated as it is possible to imagine. That was enough for the court. Unfortunately it does not seem to have been enough for the likes of Howard Shane. Since those court cases, incidentally, I have taken out a Deakin Humanities degree, taking courses at both Deakin and Melbourne universities. I have listed some of the validation tests that I was given. I did not do those tests willingly. I was outraged at having my existence as a person called into question. I felt insulted, humiliated and demeaned by being put through test after test when I felt that I had already proved myself adequately. Even now, twenty-seven years after I established my abilities in court for what I thought would be the very last time, I still have my communication doubted by people who have never taken the trouble to inform themselves of the facts on the public record. I’ve proved my communication, but even if I hadn’t I don’t think I should be subjected to this. My communication is my business. If I have complaints about misinterpretation I can make them to another communication partner. If a partner consistently misinterprets me then I cease communicating with them. In general I only have minor problems with misinterpretation, and I would see any attempt to validate my communication or that of my partners as a violation of my privacy. I objected to it in the Supreme Court and I still object. While there may be specific instances in which validation of specific communication may be necessary, to suggest that people only be allowed to communicate if they’ve passed any test any skeptic wants to push on them is not only impractical but a violation of civil liberties. Communication is not easy for people like myself, and there is nothing to gain from regulating my right to talk to whoever is prepared to take the time to listen. How can Howard Shane say that he is trying to help people with disabilities when he tries to push me out of the human race? First I was institutionalized as an affront to humanity, then evidence that I was not intellectually impaired was concealed, and then professionals like Howard Shane tell everybody that I cannot communicate. If this is what my ‘friends’ do, what can I expect from the community at large? In fact professionals are not my friends. I challenge them by being living proof that their tests and judgments are fallible. I am not the beneficiary of the work of professionals — I am their victim. I can’t get away from my disability, but I should be able to escape being cast as a permanent patient, or a permanent child. It seems I cannot. As I say, Shane claimed "Not one alleged competent user of the technique has come forward to prove the technique is genuine.” (Shane, 1993a) He called it “an inappropriate challenge to professional belief systems” I published an article containing the evidence I have listed here. (McDonald, 1993) In the next issue of the journal, Shane wrote "In light of my conclusions in the paper FC: Facilitated or 'Factitious' Communication, it would be illogical to direct a response to Anne McDonald." (Shane, 1993b: 10) This would seem a particularly effective Catch-22: the method cannot be validated unless users come forward to give evidence, and evidence presented by users cannot be entertained because the method has not yet been validated. Those people who do not accept me for what I am will be convinced on the twelfth of never, or when hell freezes over, whichever comes first, and I’m not going to take any more tests for them to ignore. If you want to know about my years in hell, try St. Nicholas Hospital. If you want to know what it did to me, read My Frankenstein. If you want to know what I think of euthanasia, read this. If you want to know more about my story, read the book I wrote with Rosemary Crossley - Annie's Coming Out, Penguin Books. It's out of print, but second-hand copies are available on Amazon and Alibris. If you want to know how I got out, look up Facilitated Communication Training. If you want to know why communication is so important, read The Right to Communicate. And there's my work on The Terrible Triple C, another one of the ways in which professionals bastardize people with disability. I also work for DEAL and Communication Rights Australia (CAUS) and speak on issues and speak on issues of disability. For my most recent articles on people without speech being bastardized see No Angel and Buried Alive. Most recently, I was given a National Disability Award, and took the opportunity to set the record straight.